Each year many children and their parents come to Hollywood from all over the world to work in television, film, music and theatre. Oakwood at Toluca Hills by Avalon is only minutes to most major studios, and is centrally located to dance studios, acting workshops and photographers. This large, controlled-access complex features 1,100 apartments, on-site laundry and dry cleaners, a convenience store, swimming pools and playgrounds. In addition to the high-quality, access-controlled housing, our Child Actor Program offers access to tutoring and educational programs to help parents learn the ins and outs of the entertainment business. What is the Child Actor Program? It is a specialized program at Oakwood at Toluca Hills by Avalon created to assist child actors and their families who decide to come to Los Angeles to pursue acting and entertainment careers. We provide discounted housing accommodations, special activities geared towards young people, access to professional studio tutoring services, acting coaching and classes, parent round table discussions, and a show biz kid expo. Some fees may apply. Why is Oakwood Toluca Hills so popular? 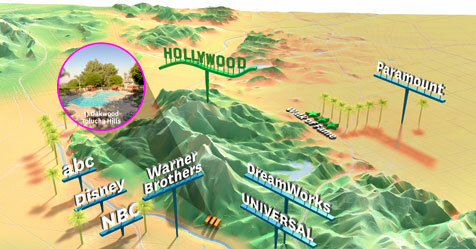 Oakwood Toluca Hills is renowned in the entertainment industry as a leader in temporary housing and is located in the media hub near all the major studios such as Warner Bros, Disney, Universal, NBC, Dreamworks, Paramount, CBS, and ABC. Will I need a car in Los Angeles? Yes. Auditions can be anywhere in the Los Angeles area. Do other child actor families stay at Oakwood? Yes. We house over 100 child actor families a year who, like yourself, are coming to Los Angeles for the first time to get their children in the entertainment industry. Have any famous child actors stayed at Oakwood? Yes. Our first child actor was Jennifer Love Hewitt. Others that have stayed with us are Christina Ricci, Kirstin Dunst, Jessica Biel, Corbin Alred, Jason Richter, Zachary Ty Brian, Michael Galleota, Larisa Oleynek, Jimmy Workman, Nikki Deloach, Countess Vaughn, and Neil Patrick Harris, just to mention a few. Can my daughter bring her dog? Do child actors only come out for pilot season in January? Not anymore. Production companies shoot all year long. Many of our child actors return in the summer months while school is out. Oakwood can refer certified tutors available from the Studio Tutoring Service to help children continue their education until they return to their regular school.